Kindergartners work toward the Lion rank. The Lion rank is earned by completing five adventures as described below. 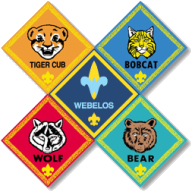 Although participation with an adult partner is required for all Lion awards, recognition items are for the Scouts only. 2. With your parent or guardian, complete the exercises in the pamphlet entitled How to Protect Your Children From Child Abuse: A Parent’s Guide. Outside of the requirements, Lion Scouts can also complete any number of seven elective adventures of their den’s or family’s choosing.